Visnja was born in Adelaide, South Australia. Her parents are Croatian, hence her unusual name, which means "cherry". As a child she learned recorder, piano and violin. Visnja composed her first piece at the age of 11 and went on to win several eisteddfods as a performer in her teens. Visnja's first professional gig was a long term residency at the Terrace Hotel in Adelaide, playing piano and singing on a little island surrounded by waterfalls. In 1997 Visnja moved to Melbourne. After a recording session with DJ Josh Abrahams, Visnja was introduced to Mark Holden, who later became an Australian Idol judge. Visnja worked with Mark and his business partner Jack Strom for several years. Mark encouraged Visnja to set up her own recording studio and helped further her career through his and his business partner's contacts in the music industry. 2002 delivered a breakthrough. Visnja won two categories in the nationwide MusicOz song competition: Best Classical Entry for her English/Spanish aria La Lumbre and Best World Music Entry for Circle Dance, sung in Croatian. By winning two categories judges noted this was an important musical achievement from a single artist. An Australian institution on Channel 9, Carols by Candlelight 2002 was Visnja's debut concert appearance before a live arena audience of 35,000 and a television audience of 4 million. Visnja sang her award-winning La Lumbre with full orchestra and choir. Following her performance, Visnja was invited by Charlie Delaney of Hi-5 to sing at her wedding in 2003. Visnja spent much of 2003 recording her debut album Mermaid. She performed original songs from the album on several TV shows and expanded her fan base at the National Folk Festival in Canberra. 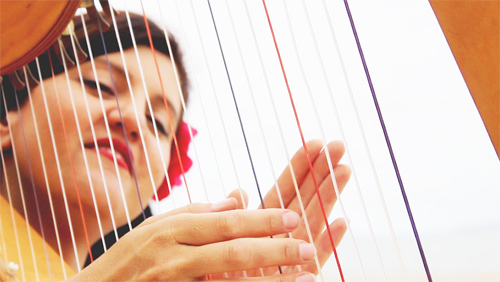 Visnja bought her first harp at the Festival, and taught herself over the coming years. Visnja was invited by Lexus to sing at their national launch of the LS430 luxury car in Sydney. The year finished with a live concert for SBS radio and television in Federation Square, Melbourne. In 2004 Visnja continued to compose and perform for special events, including a banquet for the Malaysian Royal Family. In 2005 she was commissioned to write music for a short film, and married long time partner Paul Jackson. In 2006 Visnja gave birth to their daughter Alyssa, not long after completing her album "Kitchen Fairytales". Visnja and family moved to Hepburn in Central Victoria to see if county life would suit them. During this time Visnja was commissioned to write music for a stage spectacular Zingara the Gypsy Queen. The show was a great success, having enjoyed a year long season at Conrad Jupiters Casino on the Gold Coast. In 2007 the town of Warburton in the beautiful Yarra Valley was the next destination in the family's travels. When not caring for her daughter full time, Visnja became very involved in the local community and was choir teacher at the primary school for several enjoyable years. Warburton was under direct threat of bushfire during the Black Saturday crisis in 2009, which devastated towns nearby. This prompted the family to seriously re-evaluate their lives and reconsider their future. In 2010 Visnja and her family moved to Adelaide to enjoy a gentler pace of life, combined with city living again. Visnja immediately hooked up with her former agent Don Moir, and performed in events and shows both solo and with the well respected vocal ensemble "Sonnet". Visnja and her family moved back to the Yarra Valley in April 2011. Having reconnected with Mark Holden during a charity event in Adelaide, she made several live appearances on his spots on ABC radio. In 2012 new opportunities arose that included teaching piano and vocals to students of Upper Yarra High and Little Yarra Steiner School. Visnja also had a great opportunity to perform at the Tanks Arts Centre in Cairns - combining a beautiful entertainment opportunity with a tropical Queensland holiday for the family. In 2013 Visnja launched her first children's music book called The Enchanted Song Book. She recorded a video with Mark Holden and his family band. After numerous holidays in the Far North of Queensland, Visnja and her family relocated to the lovely Port Douglas in 2014. In 2015 and beyond, Visnja continues to perform in natural settings like the beach and river valleys in her new tropical home. She recorded her first music video with talented film maker Gabriella Ferro. This video made the finals of the Port Shorts Film Festival in 2015.